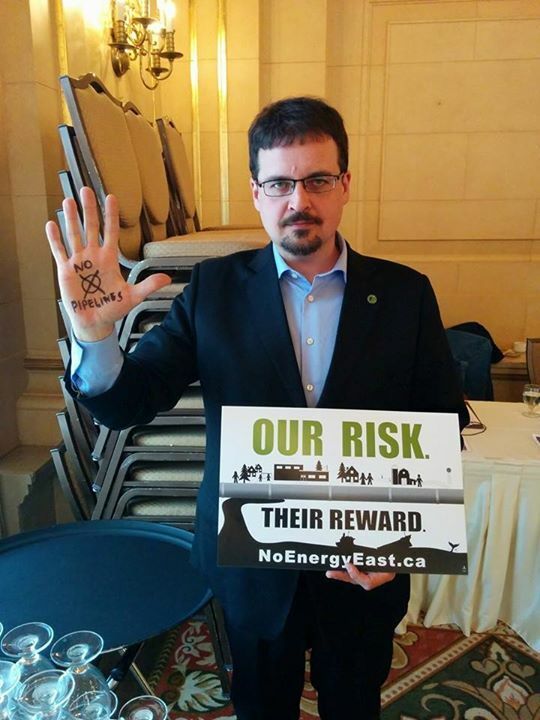 April 11, 2015 David Nickarz at Our Risk Their Reward talk at Fort Garry Hotel. On Friday the Selinger government signalled their support of the proposed Energy East pipeline after staying silent for so long,” said David Nickarz, Green Party Candidate for Wolseley and Advocate for Conservation and Water Stewardship. “The proposed Energy East pipeline will allow a 40% expansion of the Alberta Tar sands at a time when the world has agreed to reduce greenhouse gasses. Energy East would see more than one million barrels per day flowing through a decades old pipeline–this represents more greenhouse gas emissions than Manitoba’s entire economy puts out every year,” said Nickarz. The government news release is vaguely worded but is widely seen in the climate activist community as a clear signal that the proposed Energy East pipeline has the full support of the Selinger government. “I would like to hear from MLA Rob Altemeyer on this issue. Mr. Altemeyer has been quite vocal about his government’s green initiatives but silent when it comes to the very real threat to our climate posed by the expansion of the Alberta tar sands,” said Nickarz.